By now, most Hamilton Park residents and others who frequent the area have probably heard the back story to “Release,” the art installation on the construction site adjacent to the old St. Francis Hospital. For those still unfamiliar with the story, here’s the CliffsNotes version to bring you up to speed: Downtown Jersey City resident Roger Sayre teams up with fellow conceptual artist and Brooklynite Charlotte Becket to come up with a conversation-starting public art project. Together, they conceive “Release,” a steam-based concept meant to evoke random clouds of fog. The piece makes its debut, but is shut down two days later by the Jersey City Fire Department after a resident calls 911 believing the steam is actually smoke and that “Release” is a piece of construction equipment on fire. (The timing of the installation’s debut proved to be inauspicious since it came shortly after the Boston Marathon bombings. The Fire Department eventually gives the green light for “Release” to reopen on June 7 on the condition that the reopening is accompanied by an aggressive education campaign to let the public know that what they are seeing is art, not danger. Fast forward to mid-June. “Release” is up and running again – though slightly modified from the original Sayre-Becket concept – and finally generating the public conversation the artists hoped it would from the outset. Boring + boring = interesting? The genesis of “Release” dates back several months ago when Brendan Carroll, a curator who puts together public art shows for developers Paul and Eric Silverman, approached Sayre about coming up with a show for ArtBloc. 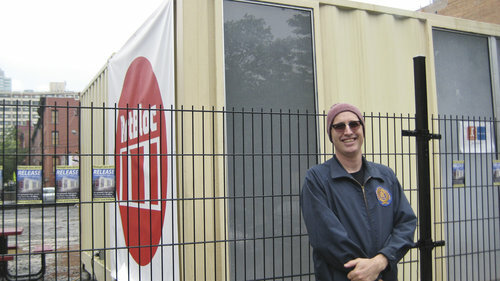 A travelling public art space developed by Angus Veil, Jennifer Daugherty, and Tim Steele, ArtBloc is actually two conjoined shipping containers that curators and artists have used to exhibit art shows across the country. Using two fog-generating machines – and a substance that, believe it or not, Sayre said really is called “Fog Juice” – the shipping containers fill up with steam that emits from the crevices of the containers after the machines have been going for about five minutes. This steam then wafts through the air outside the containers for about 60 minutes. Depending on the weather and wind pattern on any given day, the effect can be either beautiful, or eerie. Sayre and Becket, who are both art teachers at Pace University, had originally programmed the fog machines to go off at random times throughout the day and night, similar to those vegetable misters that spray produce in the supermarket. In a compromise with the Fire Department, however, “Release” is now scheduled by timers to go off twice daily, at noon and 8 p.m.
“Is the art meant to be what’s inside the shipping container, or that cloud that’s coming out of the shipping container?” asked one passerby who did not want to give his name. He and others stayed for several minutes to watch puffs of fog blow out of the container. The ArtBloc sits behind a fence on which there are signs that explain that “Release” is an art installation. Still, many people see the fog and focus on that and completely ignore the sign. Sayre said that while many adults are apprehensive about “Release,” children are not. “They approach it with this sense of wonder and curiosity that you usually don’t see among adults,” he said. The exhibit will remain through the end of June, and may be extended, Sayre said. To see a short video of “Release,” click the link embedded in this story on HudsonReporter.com. E-mail E. Assata Wright at awright@hudsonreporter.com.